We’d love your help. Let us know what’s wrong with this preview of The Looking Glass by Janet McNally. Sylvie is trying to carry on Julia’s impressive legacy at the prestigious National Ballet Theatre Academy, but Julia, ever the star of the show, can’t stay hidde GIRLS IN TROUBLE. To ask other readers questions about The Looking Glass, please sign up. does this book have magic? April Sounds like it -- there are supposed to be storybook characters who start showing up in the real world. So poignant, imaginative, poetic, beautifully written and imagine--you will not be able to put this book down. It's drawn comparisons to Melissa Albert's "The Hazel Wood" and rightly so--a modern fable in the big city, a surprise road trip, adorned with fairy tales. If you missed McNally's debut, "Girls in the Moon," go pick that up, too, because she writes the kinds of books that are made for dreamy, rainy afternoons with nothing to do but read, read, read. I haven't got much to say about this book except that I liked it very much. the story was interesting, the characters were likeable, the chapters were short which are much appreciated nowadays, the plot was easy to follow and I devoured this book in a matter of couple of hours. The story contains magical elements in it, poetry as well as Stevie Nicks with whom I became obsessed with a couple of years ago. I loved how the modern world and fairy tales started overlepping into the reality. I've never came across to a book whose main character shares the same name as mine. I feel so special. This book comes out on my birthday and it is the perfect present. Wispy, dreamlike, warm, and golden. A story about sisters and dance and Fleetwood Mac and fairytales and signs from the universe and random things we may read as signs from the universe. It is a gentle, sweet, beautifully written daydream of book for those looking to bask in gorgeous language and well-drawn characters. Don't read this book expecting to buckle up for a wild ride; read it in the grass under the sun, or curled up in bl This book comes out on my birthday and it is the perfect present. Going into The Looking Glass, I wasn’t entirely sure of what to expect. I knew it featured some of my very favorite things– ballerinas, a road trip, hints of magic, and Fleetwood Mac. However, I didn’t expect the beautiful writing or how much of a hidden gem it would be. The story follows our protagonist, Sylvie Blake, This review originally appeared on Novel Ink. The story follows our protagonist, Sylvie Blake, as she tries to both process her sister Julia’s year-long disappearance and uphold Julia’s impressive legacy at the prestigious ballet school she attends. On her birthday, Sylvie receives mail from Julia– the first anyone has heard from her in a year. Julia has sent her a book of fairytales beloved by both of the sisters as children. Sylvie finds a drawing in the back of the book, presumably made by Julia, and sets off to find her older sister, using the drawing as a road map. Sylvie’s road trip companion is her best friend’s older brother, and naturally, a romance develops between the two of them. However, romance takes a backseat to other, more important themes in The Looking Glass. This is a story about family, about fairytales (and the fairytales we create about the people we love), about signs from the universe– or, at least, the things we perceive as signs from the universe. I LOVE books about ballerinas and ballet schools (see also: Tiny Pretty Things; First Position), so I loved reading about Sylvie’s and Julia’s experiences as ballerinas. The almost-otherwordly perception of ballet as an art form and of the ballerinas who perform it fit perfectly with the fairytale-like quality of The Looking Glass. Speaking of fairytales, this book is chock-full of fairytales coming to life. It’s a modern fairytale in its own right, set against the backdrop of New York City. I’m not big on fairytales and retellings, but I thought the way McNally incorporated these elements into the book was brilliantly done. As frequent readers of the blog probably have noticed, I’ve been on a fabulism and magical realism kick recently, and this book was the perfect, magical read. McNally’s lyrical, lovely writing definitely contributed to the atmosphere and magic of The Looking Glass. I’m intrigued to go back and pick up her debut now, because I found her writing so immersive and compulsively readable. Also, it’s worth mentioning: if you’re a Fleetwood Mac fan, you HAVE to pick this one up. Fleetwood Mac is the soundtrack of Sylvie’s roadtrip, and every chapter is named after one of their songs. Once again, this was a brilliant choice because all of the mystique and intrigue surrounding the band (and their legendary frontwoman, Stevie Nicks), felt like the perfect fit for such an ethereal story. Sylvie described her sister as "a red giant, blazing scarlet". She looked up to her and idolized her, and then, Julie disappeared. When Julie sent Sylvie her childhood book a year later, Sylvie believed it was a sign she wanted to be found. But, sometimes a girl in trouble doesn't need or want saving. • Pro: As someone, who has lost a loved one to addiction, I really related to many of the things Sylvie and her family were experiencing. The pain, the anger, the despair -- it was all there. • Pro: Sylvie described her sister as "a red giant, blazing scarlet". She looked up to her and idolized her, and then, Julie disappeared. When Julie sent Sylvie her childhood book a year later, Sylvie believed it was a sign she wanted to be found. But, sometimes a girl in trouble doesn't need or want saving. • Pro: I am a former dance mom, and I found myself enamored with all the ballet in this book. Not only did McNally share the beautiful parts of a ballerina's life, she also shed some light on the difficult parts. So when Sylvie's brother says, "ballet dancers are superheroes. They go through some major pain to make something beautiful," I found I could only agree with him. • Pro: Sylvie was struggling with so many things, and this search for her sister gave her the time and space to work through many of those issues - the loss of her sister, her broken family, her doubt about her future. She had many BIG things on her mind, and this journey ended with some good and bad outcomes. • Pro: I love a good road trip, and this one had a lot of really fun moments. Fleetwood Mac, fairy houses, and Wegmans - what more could I ask for. • Pro: I really adored the way McNally told this story. She gave the story a little touch of sort-of-magic, intertwining the fairytale touches brilliantly, and just provided me with such a beautiful and vivid story. • Pro: I wasn't sure about Jack, but that road trip changed my mind. He was complicated, but I loved the way he interacted with Sylvie, and I liked that he was such a rock for her. I also ADORED Tommy. I could have used more of him in this story, because his friendship with Sylvie was really special, and I thought he was really special too. Overall: A bittersweet story of sisterhood and self exploration, which was touching, heartfelt, and beautifully told. Certain aspects of THE LOOKING GLASS were interesting enough for me to see it through to the end, but ultimately, this just wasn’t for me. I'm not sure how Janet always to write the stories I long to read, and this book is no exception! A story of fairytales mysteriously popping themselves up into reality. It's a heartfelt adventure twisted into a magic-like adventure of looking for someone loved and gone. It's delightful, wonderful, poetic in ways I aim to write! Now, I'm off to have a Fleetwood Mac binge! This story was sweet and sad, and as eager as I was to finish the book, I didn't want it to end. I did expect a little more ballet in action, but I appreciated the copious amounts of Fleetwood Mac, the road tripping, and the maybe-fairy tale characters appearing throughout. I actually found the fairy tales more believable than Jack and Sylvie's visit to that camp, but that's a personal bias from my own camp experience. I kept waiting for something actually whimsical to happen in this book and it just never happened. It was a letdown. I disliked how Slyvie was always 'I've got it covered' or 'I know just where to go', none of it felt planned when the author was writing it. Why would they go to a zoo? Another thing that annoyed me was how all of the sudden this character whom we can only assume Read my full review here! Another thing that annoyed me was how all of the sudden this character whom we can only assume has followed the rules, loves to dance, and never lies to her parents, just starts blatantly lying and gets a tattoo at 16? Much like her ballerina heroine, Janet McNally makes her effervescent writing seem effortless. But there's grit beneath the glitter of this charming road-trip fairytale. Stock up on highlighters: you'll want to underline every perfect sentence. A story based on an intimate bond between two sisters but also the challenge of finding your place in the universe with gorgeous writing and hints of magical realism. I thoroughly enjoyed it but I wish the fairy tale aspect was more prominent because it would've made the otherwise simple plot more interesting. There was something about this story that was simplistic and charming wrapped up in a very pretty bow. It flowed and weaved together and before you know it, I was at the end. The very abrupt end. Sylvia as the main character was cool. She had her quirks, but she felt real to me. Jack was cool, too. I appreciated that he had his own issues he was dealing with and You can see my full review here! There was something about this story that was simplistic and charming wrapped up in a very pretty bow. It flowed and weaved together and before you know it, I was at the end. The very abrupt end. Sylvia as the main character was cool. She had her quirks, but she felt real to me. Jack was cool, too. I appreciated that he had his own issues he was dealing with and he wasn’t just her chauffeur/love interest. With ballet being a pretty big plot point, it was kind of disappointing that it was more of a passing mention rather than something we’re shown. It’s here and there, but it’s a show-not-tell situation. However, I really appreciated the ending. I do wish we could’ve gotten a look at the parents and how they coped with things. But, it had closure, yet was left open enough to hammer the point of the future is still full of healing and possibility. What an imaginative, well written story of sisterly love and so much more. I couldn't put it down. Janet McNally has a true command of poetic language! My favorite books are the ones that take you on journeys. Some are emotional, some transport readers to exciting new worlds, and others take place in a world like the one we inhabit. What's always fascinating is when authors blur the lines between these journeys and create something otherworldly yet steeped in reality, hard-hitting yet sweet. Janet McNally seemed to be going in that direction when the first synopsis for The Looking Glass was released. From ballet to a road trip to find a missing My favorite books are the ones that take you on journeys. Some are emotional, some transport readers to exciting new worlds, and others take place in a world like the one we inhabit. What's always fascinating is when authors blur the lines between these journeys and create something otherworldly yet steeped in reality, hard-hitting yet sweet. Janet McNally seemed to be going in that direction when the first synopsis for The Looking Glass was released. From ballet to a road trip to find a missing sister to modern day fairy tale girls appearing in everyday life, complete with a Fleetwood Mac soundtrack, I was on board, especially after recalling how lush McNally's prior writing had been in her debut novel and poetry book. I eagerly pre-ordered the novel and completely dismissed my TBR pile just for the sole purpose of reading it. I was not disappointed in the slightest. The Looking Glass is a ruminative and gorgeous book centered around the magic of fairy tales, sisterly devotion, and one girl's journey to forging her own identity outside her sister's while still clinging onto the enigma left behind. Not only is McNally's gorgeous prose front and center among the pages of this story, there are wonderful characters, great jokes, potent fairy tale and song allusions, and scenes that feel so intensely visualized that they're happening around the reader. Reading this novel was an absolute treat, and watching its slow lyrical cadence weave its way through interesting plot points made it all the more invigorating. It's safe to say that McNally is one of my favorite writers now, and I can't wait to see what she writes next. I hope it is just as magical as this. Sylvie Blake has been her sister's shadow all her life. A ballerina dancer just about to hit the level where dancing becomes her full-time profession, she finds herself wondering if she'll ever be able to follow in Julia's footsteps. Julia, seven years older than her, left home a year ago after a tragic accident led to painkiller addiction, and before that, she was one of the best professional dancers in New York. Now that she's gone, Sylvie finds herself pressured to fill in the spot Jules left behind and become a star that burns as bright as her. But Sylvie is unsure if she'll hit that point. One day, a package with Julia's handwriting gets delivered to her by her favorite dance teacher, and within it is a copy of Grimm's fairy tales with the title rewritten just like it was when the girls were young: Girls in Trouble. Suddenly, Sylvie's world becomes filled with the modern-day adaptation of ladies she grew up reading about, and it fuels her desire to find her sister. Accompanied by her best friend's older brother, his Volvo, and everyone that's part of classic rock band Fleetwood Mac, the road trip begins. With detours along the way, and Jack breaking down his guard to show sides of him Sylvie never knew existed, will Sylvie be able to find her sister? Will she learn to carve her own space out for herself? Or will she forever be the damsel in Julia's vacancy? Like I mentioned before, this story is shown through absolutely breathtaking prose. McNally has such a lyrical way of writing, and much like with Girls in the Moon, it really comes into play when it comes to details and descriptions. Despite ballet merely being a backdrop here (which will probably make the readers who are interested in ballet sad), McNally intricately weaves it in throughout the novel, referencing dance moves, the power of gravity, and how effortless it must look for something that requires so much effort. It's also impressive how imaginative her fairy tale girl interpretations are here, and how they're crafted really showcases the fine line between reality and magic. The descriptions and dialogue follow this format as well, and I couldn't help but relish in it all as I kept turning the pages. It's truly the stuff of legends. The cast in this book carries this amazing quality too. I really enjoyed all of the characters here. Sylvie isn't as snarky as McNally's last protagonist Phoebe, but she carries some great humor and a wistfulness that reflects the fairy tales she grew up reading. It bounced off well with her best friends Sadie and Tommy, the former a bubbly girl who always looks out for her and the latter a company ballerina that looks on the bright side of things and wouldn't mind finding a prince in the meantime. The banter these three share throughout the book is hysterical. I also loved Sylvie's growing relationship with Sadie's older brother Jack, and their romance by the end of the book was endearing and truly something special. I love my slow burns. Additionally interesting was how Julia was portrayed. The road trip consists of several stops where Sylvie follows a list of people Jules left in a flower at the back of the fairy tale book (including the eldest Blake child, Everett, a comic artist with a dystopian New York series that sounds amazing). Their perspectives on Julia related on their closeness to her and Sylvie's perceptions of her sister overlap to create this image of a young woman who loved dancing and would do anything to make sure she was following her dreams. The other detours shape the narrative just as much because other characters, both major and minor, get development and their own little time to shine. A few even directly reference Fleetwood Mac, which was greatly appreciated because Fleetwood Mac is a great band with some wonderful albums. So at the end of the day, The Looking Glass is an awesome novel. Luminescent prose, awesome characters, and clever allusions make a compelling story that unfolds slowly and perfectly for a road trip book that isn't just about a road trip. Sisters, best friends, love, dancing, music, and fairy tales are here too, and they provide just as much of an anchor as the aforementioned trip. If you love writing that feels like the beating heart of a beautiful song, Fleetwood Mac references, or looking for a YA contemporary complete with magical realism, pick this title up. You won't regret it or forget it. What an absolutely beautiful novel. Truly one of my new favorites and one I’m going to be pushing into the arms of friends and strangers for the rest of my life. Have my favorite Fleetwood Mac song as a gift. Aw, that cover is so pretty! It's too bad the book was pushed back to August according to the Epic Reads blog, though :(. a really beautiful book, about sisters, and loss, and ballet, and young love, and trying to save someone only to find that they need to save themselves. It dances on the edge of fantasy, but never quite crosses over into the impossible. Lovely. After trying, and failing, to articulate my various thoughts about this book without rambling, I think I’ll keep it simple. This wasn’t the story I thought it was going to be, and, ultimately, it wasn’t my cup of tea. The fact that this has chapters with Fleetwood Mac titles sold me. All in all a good book about a girl trying to find her sister Julia, who disappeared with the help of a boy in an old beat up car. Real rating-hmmm...I’d say about 4.25 stars. I’ll admit that I had semi-low expectations for this book. I forget exactly where and how I found out about it, but I put it on hold at the library for a while, and patiently waited for it to arrive (even though by then, I had forgotten what the book was even about). Fast forward to when I actually read it, and man, I really enjoyed it! 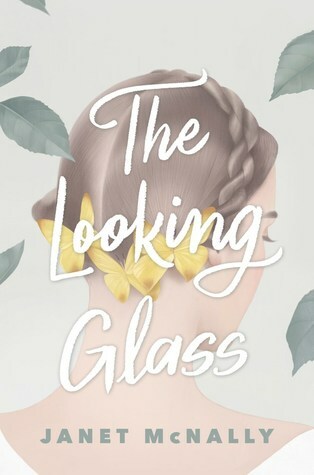 “The Looking Glass” is simultaneously heartwarming and gutwrenching, with beautiful writing and characters with hear Real rating-hmmm...I’d say about 4.25 stars. On the outside, they were a perfect family. A father’s who is a wealthy businessman, a mother who throws the best charity dinners, a son and two daughters, who were both exceptional ballet dancers. The first crack in the family was when the son, Everett, dropped out of college to become a comic book artist. The second when Julia’ addiction to pain medicine hit the spotlight after the accident. The final crack was when Julia left in the middle of the night, never telling her family where she was going. From that night it has been a year since Sylvie saw her sister. At the Academy no one spoke her name, it was as if Julia never existed, and only Sylvie and Miss. Diana, knew she existed. Her friends realize they do not know how to talk to Sylvie, so they just stopped. Only Tommy and Sadie, who was not a ballerina, kept by her side. Sylvie’s birthday, Julia sent her a copy of their favorite childhood story book. Years before Sylvie lost the book in Quebec, but here it was again, the same or maybe a different copy of Fairy Tales of the Brothers Grimm, in which Julia crossed out that title and wrote her own: Girls in Trouble. Seeing fairy tale creatures everywhere, Sylvie started off her quest, along with Sadie’s older brother, Jack, as her driver. The quest was following the flower petal names Julia wrote in the back of the book: Sylvie, Grace, Rose, Thatcher, and Daniela. Deterring to pick up the pieces of her sister’s year old trail, Sylvie was off to save her sister, as well as the other girls in trouble she finds along the way. As gorgeous as her first book. Beautiful, lyrical writing and a charming spunky story of sisterhood make for a perfect read. Have a highlighter ready to underline all the poetic sentences! NOTE: This book has not yet been released. I was given a free Advance Reading Copy by HarperCollins and Edelweiss in exchange for an honest review. This book will be released on August 14, 2018. If you would like to send me an ARC, please see this page. The main reason I end up not finishing books is because they bore me, and unfortunately, that was the case here. While I didn't find Sylvia to be unlikable, per se, she didn't really interest me, and I didn't know enough about t NOTE: This book has not yet been released. I was given a free Advance Reading Copy by HarperCollins and Edelweiss in exchange for an honest review. This book will be released on August 14, 2018. If you would like to send me an ARC, please see this page. THE LOOKING GLASS by Janet McNally is a young adult novel set in the highly competitive world of aspiring New York City ballerinas. The book begins on Sylvie’s birthday when she gets a mysterious gift from her sister, Julia, who’s been missing for a year. Believing this is a call for help, Sylvie decides to go in search of her to bring her home to safety. Jack, her unlikely ally and best friend’s older brother, is her chauffeur, and together they set off on a road trip, following what Sylvie bel THE LOOKING GLASS by Janet McNally is a young adult novel set in the highly competitive world of aspiring New York City ballerinas. The book begins on Sylvie’s birthday when she gets a mysterious gift from her sister, Julia, who’s been missing for a year. Believing this is a call for help, Sylvie decides to go in search of her to bring her home to safety. Jack, her unlikely ally and best friend’s older brother, is her chauffeur, and together they set off on a road trip, following what Sylvie believes to be a map drawn for her by Julia. Unsure of how to fully decode the map, Sylvie charges ahead like a prince on a white horse. This contemporary setting is peppered with fantastical elements, blending genres with magical realism. Most of the otherworldly flourishes are cognizant woodland creatures and princess-like girls. When they appear, Sylvie, at first, thinks she’s losing her mind, but then, she believes they are trying to lead her towards her sister. After all, Julia’s gift to Sylvie is a fairytale book from their childhood. These moments definitely make the story unique, but they oftentimes feel forced, as though the author wants them there, as opposed to them needing to be there for story. These small escapes from reality occasionally drive the plot forward, but overall, they distract from the real substance. The book, on a whole, would have been stronger without them. I love how McNally crafts Sylvie’s world so much, which is why I missed it when she strayed. The life of a training ballerina is so intriguing. From the ballet instructor’s quirks and sayings to how Sylvie saved her first three sets of pointe shoes, these behind-the-scenes details make the setting lush, elaborate, and easy to imagine. How McNally portrays New York City is also accurate and a nice glimpse into how the wealthy live. Though I must contest Ocean City, New Jersey smelling like anything other than fresh salt air, the rest of the road trip destinations are described well and make me feel like I'm along for the ride. Occasionally, Sylvie breaks the fourth wall, so to speak, by being aware of the audience and addressing them directly. Every time this happens, I am completely throw off, because it’s not carried on throughout the novel in a consistent fashion. With that being said, I love the blossoming romance between Sylvie and Jack so much. I root for them Mac after Mac song, and I really enjoy that the book ends in a way that feels like real life. The characters break through some serious traumas, and though there is a light at the end of the tunnel, more difficulties still lay ahead. THE LOOKING GLASS is a great book for those needing to find a little magic in their day-to-day lives. It’s been so long since I read a book this good I could cry. It’s just wonderful. I loved it. It had just the right amount of magic, melancholy and joy. The story follows Sylvie, she’s a seventeen-year-old girl, rapidly approaching a professional ballet career. Apparently, her life is perfect, but on the inside her heart has been torn ever since her greater-than-life, big sister, Julia skipped town. Nowadays Sylvie navigates life with uncertainty, wondering if the strange things she sees are real It’s been so long since I read a book this good I could cry. It’s just wonderful. I loved it. It had just the right amount of magic, melancholy and joy. The story follows Sylvie, she’s a seventeen-year-old girl, rapidly approaching a professional ballet career. Apparently, her life is perfect, but on the inside her heart has been torn ever since her greater-than-life, big sister, Julia skipped town. Nowadays Sylvie navigates life with uncertainty, wondering if the strange things she sees are real and trying to fill in the shoes of her sister, who’s starting to feel more like a story than a real person. So, before Sylvie loses her head entirely, she decides to go looking for Julia, and hopefully find out how to move on as well. The writing style is nothing short of beautiful. Despite the story having a modern-day setting, it reads like a fairy tale. Which suits the plot very well. The descriptions are vivid, making it very easy for the story to envelop you. The characters are so well portrayed. Not only the main ones, but even the tiny ones are so easy to picture. Their motivations and personalities are clear as water, and you can see, and make sense of their interactions. I loved Sylvie, her struggle trying to find who she is herself, apart from her sister was so compelling. The romance won me little by little. I didn’t I was going to like it, but it became one of the very best parts of the story without necessarily recurring to any clichés or tropes. It grew very naturally and so sweetly. The atmosphere alone had me glued to the story from the very first pages. This book combines just the right parts of sadness, grief, hope and joy, all of it with a subtle touch of magic that made reading it such an enjoyable experience. It came along just at the right point in my life. The Looking Glass has definitely gained a place in my heart. And in my mind, because honestly, I’ve been thinking about non-stop it since I finished it. I might even re-read it once I get my hands on a printed copy. So you know, if you like magical realism, this lovely book is for you. I received a copy in exchange for an honest review from the publisher via Edelweiss. 💭 My Thoughts: I saw this book go on pre-reserve on my library app, and snatched it up. When I finally saw it on my shelf, I picked it up right away. I finished it in under three hours! It was sooo good! The writing was beautiful, the fairy tale touches were magical. Honestly, the book feels wispy, almost like a dream as you read it. I loved it. I loved that everything doesn’t wrap up into a perfectly happily ever after at the end because that’s not real life and it felt important to acknowledge 💭 My Thoughts: I saw this book go on pre-reserve on my library app, and snatched it up. When I finally saw it on my shelf, I picked it up right away. I finished it in under three hours! It was sooo good! The writing was beautiful, the fairy tale touches were magical. Honestly, the book feels wispy, almost like a dream as you read it. I loved it. I loved that everything doesn’t wrap up into a perfectly happily ever after at the end because that’s not real life and it felt important to acknowledge that at the end of this story. It’s such a good read, with sisterhood and a touch of an innocent romance included. Read it; I don’t think you’ll regret it. I'm pretty sure that this was my very first magical realism book (crazy, I know!) and I absolutely loved it. Sylvie Blake's older sister Julia left one year ago without much explanation. Sylvie continues life on. Yes, her heart still aches for Jules, but there isn't much she can do about it, right? One day, when Julia sends Sylvie a book of fairy tales from their childhood, Sylvie is launched into a whole new adventure. With the help of her best friend's brother, his car, and her dog, is there a I'm pretty sure that this was my very first magical realism book (crazy, I know!) and I absolutely loved it. Sylvie Blake's older sister Julia left one year ago without much explanation. Sylvie continues life on. Yes, her heart still aches for Jules, but there isn't much she can do about it, right? One day, when Julia sends Sylvie a book of fairy tales from their childhood, Sylvie is launched into a whole new adventure. With the help of her best friend's brother, his car, and her dog, is there a chance that they could find her, at last? The humor in this book was also really great! Tommy was such a fun partner to read about, and his friendship with Sylvie was super sweet. He made a bunch of jokes that could always make you smile. Another creative thing that I definitely loved was how Sylvie saw aspects of fairy tales in her daily life, really giving me an example of magical realism. For example, there was a time when she saw a woman in a blue dress running with her (supposedly) boyfriend when she loses a shoe but then leaves it behind. Or, when she saw a girl in a red cloak with a large dog that looked like a wolf. Some things that I didn't really like about this book was that it didn't go into much detail about Julia's accident, which I really wanted to understand more. Another thing is that Sylvie doesn't really grow as much as she could, but I still loved all the characters and their personalities. There are some themes related to drugs and addiction, but it doesn't go into detail other than mentioning it. I would recommend this book for 12/13 and up, a really amazing book for people who love fairy tales mixed with contemporary-ish life. 5 stars!! !